This material, that was headed for the trash, is reclaimed and handmade into a beautiful object that is now an intimate part of someone's life. The leather bow ties speak to a rich, handcrafted, artisan heritage that is so missed and appreciated. 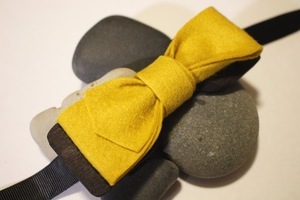 This is not your average bow tie, it is unusual, it is extraordinary, it is a conversation piece. We take found objects and refashion them into something beautiful that has value, and translate that creativity into economic opportunities for our community.